Purchase order or PO is the first formal offer document created by the buyer and delivered to the seller, with an aim of making purchase. When the document is accepted by the seller, it becomes a legally binding contract between the two parties. It indicates the type, quality, quantity, rate of the goods desired by the buyer. Once, the goods are delivered invoice is issued to the buyer for payment. Invoice is a commercial document, which is used by the seller to notify the buyer that payment is due. 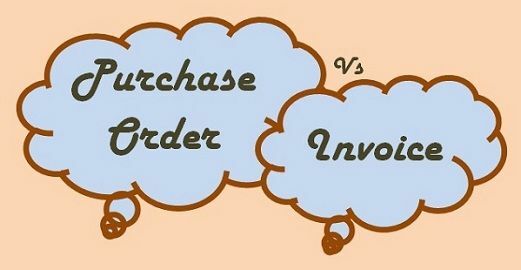 The main difference between purchase order and invoice is that while a purchase order is just to order goods from the seller and thus it defines the selling terms. On the other hand, invoice is used to authorize sale, it is a confirmaton document. Take a read of the article presented to you, to have a better understanding on the two topics. Meaning Purchase Order is a commercial instrument used for ordering goods from the supplier. An Invoice is a commercial instrument indicating the payment 'due' against goods sold. A document used by the buyer to order required goods from the supplier is known as a purchase order. The order comprises of the list of products or services along with its agreed price the seller would offer. If accepted, it becomes a binding contract between both the parties. The purchase order is produced by the buyer and issued to the supplier for acceptance. A copy of purchase order is sent to the account payable department so that it can be matched with the invoice in the future. When the goods have been delivered to the buyer, the seller issues a document to the buyer, to request for payment of the goods delivered. This document is known as the invoice. It is the indicator of indebtedness of the purchaser to the seller, i.e. goods of some value have been delivered to the buyer on which payment is still due. It creates a debtor-creditor relationship between buyer and seller. Purchase Order is created by the buyer while the seller creates an invoice. Purchase Order is issued to the seller whereas Invoice is issued to the buyer. The Purchase Order contains only purchase order number while invoice includes both purchase order number and invoice number. Purchase Order is a kind of proposal to the seller made by the purchaser for entering into a contract for sale. Issuing the purchase order is the beginning of the contract which completes on the final settlement of the transaction. When goods are sent to the buyer, the seller issues an invoice in which the details of goods delivered are specified. On the acceptance of the invoice the sale is confirmed, after that when the payment is made the deal is completed. Nice post, now I have better understanding of the two. Thank you for the simplest way of explaining. Thanks again.